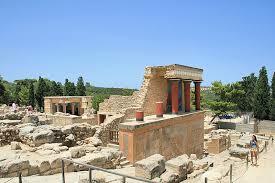 Knossos Palace was built gradually between 1700 and 1400 BC. It was discovered in 1878 by Minos Kalokerinos and excavated by Sir Arthur Evans in 1900s. The intricate Palace of King Minos is the largest and the most spectacular of all the Minoan palatial centres. The 20,000 square meters slowly unfold before you in a labyrinth-like pattern of 1200 rooms, at the center of which there is an enormous courtyard. Colorful friezes and frescoes, figures and paintings on plaster, many of which have been restored to their former beauty, fill the walls of the palace and exhibit life from this era. Varying pictures from animals and people to gods and various ceremonies depict an advanced and sophisticated society. The variety of building materials used and the marble revetment show an advanced level of technology. This is also demonstrated by some architectural and structural features, such as the light-wells and the complex drainage and water-supply systems. and you will hear the Legend of the Minotaur and the Bull Dancers. Leaving the Palace you are taken into Heraklion at the region of Pateles. Υou can visit the open market known as the “gipsy market” where you can find everything like vegetables, fruit, clothes, shoes and many more in really cheap prices. The atmosphere feels oriental and the screams of the vendors amuses whoever passes. We then proceed to the Historical center of Heraklion with the Loggia and the Morosini fountain at the “Lions’Square”. You have enough free time for shopping and lunch before you are taken back to your hotels. What’s Included• Professional and Multilingual speaking guide.• Free pick up service from any place between Malia – Agia Pelagia.What’s Excluded• Tips and Individual expenses. • Entrance to Knossos (15€). Free of Charge for Children up to 4 years. • 50% discount for Children 5 – 12 years old (tour prices & extras).